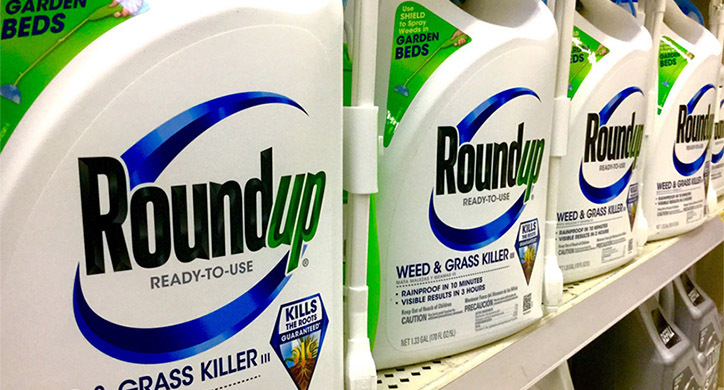 Glyphosate, or “Roundup” as it is more commonly called, is used around home gardens and agriculture, and specifically is the herbicide used on genetically modified (GM) crops. Is the product that has been deemed safe for 40 years really dangerous to our health? While the Dirt to Dinner team has been somewhat outspoken on the undeniable global benefits of genetic engineering technology, we are admittedly concerned about our environment and the effect pesticide use has on a surrounding ecosystem. But, we asked ourselves—what is the science behind this herbicide? 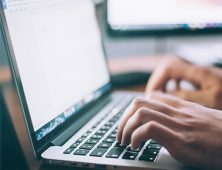 What is verified research telling us? And…what is glyphosate? Glyphosate is the world’s most widely-used broad-spectrum herbicide and the primary active ingredient in the popular “Roundup Ready” brand of herbicide products. There are over 750 products containing glyphosate for sale in the U.S. It is registered in more than 130 countries and approved for weed control in more than 100 crops. Glyphosate is used in agriculture, golf course management, forestry, lawns and gardens, and even aquatic environments. In fact, no other herbicide compares in terms of numbers of approved uses! 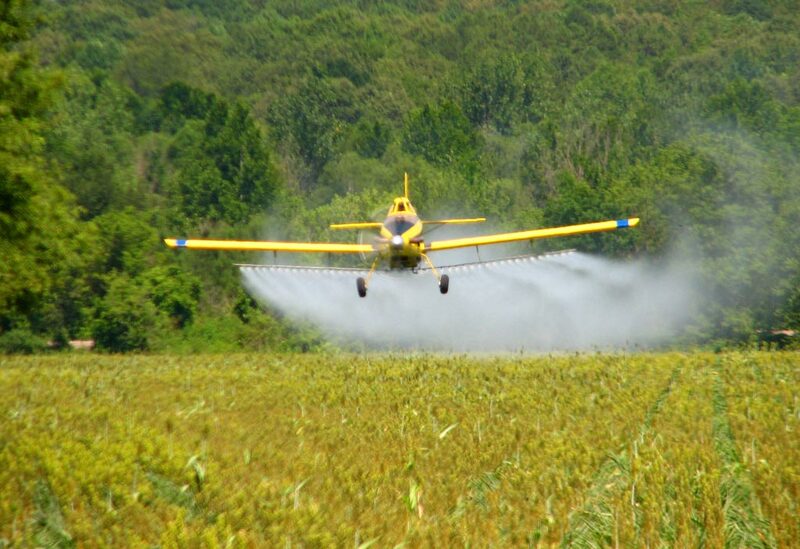 The primary agricultural crops for glyphosate application include soy, corn, canola, alfalfa, cotton, and sorghum. According to USDA survey data, in 2016 HT (herbicide-tolerant) soybeans represent 94% of soybean acreage, HT cotton represents 89% of cotton acreage, and HT corn represents 89% of corn acreage. In simple terms, glyphosate prevents a plant from growing. How? It inhibits the activity of an enzyme, called EPSP, which is essential to plant growth. This particular enzyme is not found in humans or animals. Manufacturers formulate the glyphosate acid with a salt which makes the product easy to handle and mix well with other products. The formula also includes a surfactant which assists the delivery of glyphosate into the plant by attaching itself to the leaf’s waxy surface, where it is broken down and enters the plant tissue. Once inside the plant, glyphosate inhibits the activity of the EPSP enzyme, which in turn prevents the plant from manufacturing certain amino acids essential for plant growth and life. 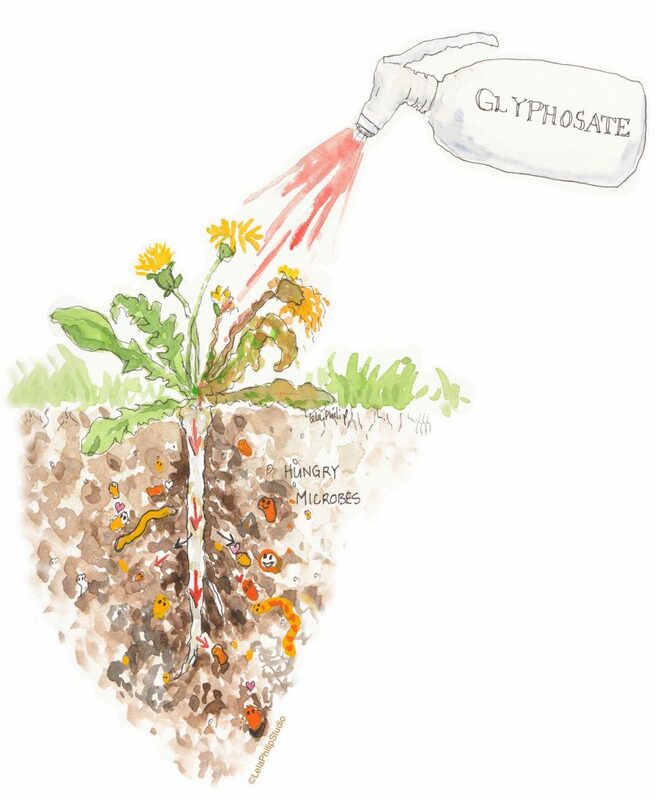 Glyphosate absorbs quickly and tightly binds to the soil. Microbes in the soil rapidly decompose the product so little—if any— product leaches from the applied area. What are the benefits of glyphosate? 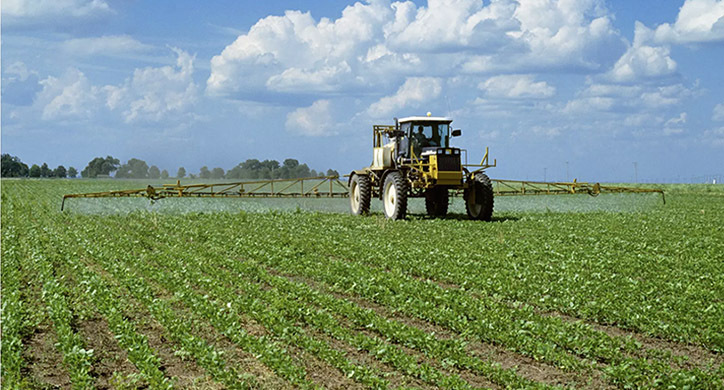 Herbicide-tolerant crops, otherwise known as “Roundup Ready” or GMOs, were created so a farmer could spray glyphosate on the fields and not harm their crop. These crops contain a version of the enzyme that is not inhibited by glyphosate. Primarily, glyphosate is applied a couple of weeks after the crop emerges from the ground, which is a critical time when the weeds and crops are competing for water, mineral nutrients, and light, and before the crops get large enough to create a canopy to shield out the weeds themselves. By killing all the weeds and not the crop, a farmer can make fewer herbicide passes through his crop. In addition, the farmer doesn’t have to “till” their field to rip out the weeds. This benefits the fertile topsoil and prevents it from run-off or displacement. 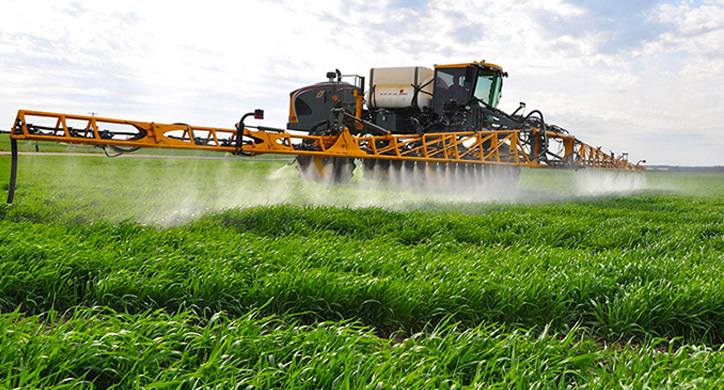 In wet areas, glyphosate is sometimes used as a tool for drying down crops before harvest. How much glyphosate does the average farmer use? Soybean and wheat farmer Brian Scott, who writes from A Farmer’s Life, farms 2,300 acres of land in northwest Indiana. In this video, he shows how much glyphosate is applied to his soybeans, which ends up being less than 2 cans of 12oz. soda for every acre of land. Contrary to what is often reported by much of the media, farmers do not douse, drown, drench or saturate crops in chemicals. Farmers actually do what they can to minimize total herbicide use. After all, chemicals are expensive, it takes resources and time to apply them, and there are crop rotation and herbicide resistant issues to contend with. Glyphosate is an herbicide, so it is a toxic substance. As we have mentioned in Nix the Toxins, toxicity is related to the dose or the amount you consume, inhale or rub on your skin. To examine toxicity, scientists look at something called the LD50 value. This metric is a standard measurement of acute toxicity for chemicals. For example, caffeine, vitamins, and other substances are beneficial in small doses but can be harmful in large amounts. 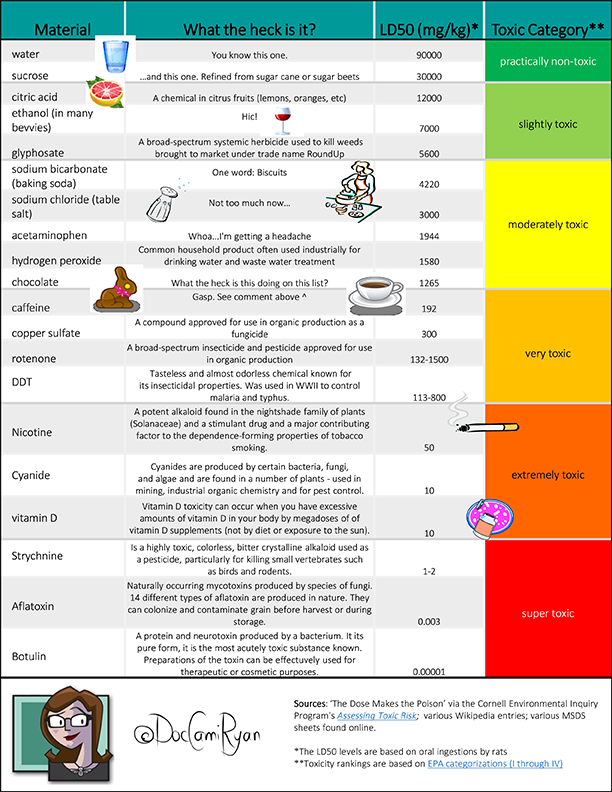 The lower the LD50 value, the more toxic the substance. Sodium chloride (table salt) has an LD50 of about 3000 mg/kg. What about the long-term effects of glyphosate? LD50 values are not the only metric the EPA uses to evaluate toxicity. Sub-chronic and chronic effects of a chemical substance are evaluated as well. 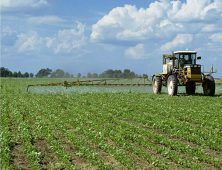 The EPA sets maximum safe levels of pesticide residues for crops, called tolerances. The EPA also calculates the theoretical maximum, which is considered the worst case scenario exposure to pesticides from all foods and compares it to the level of daily exposure to a pesticide residue, which over a 70-year human life span is believed to have no negative effect. 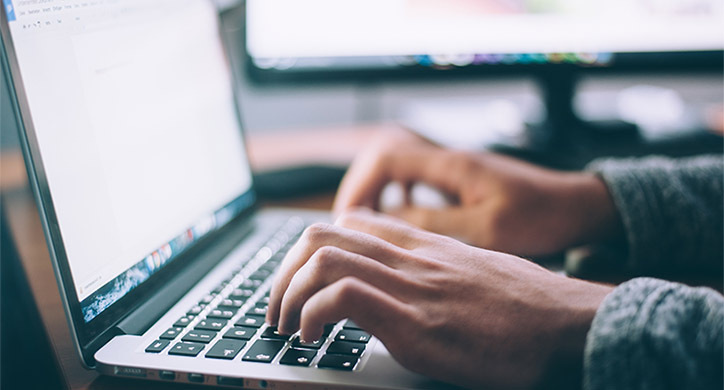 The highest dose or exposure level that produces no noticeable adverse effect on test animals is then divided by safety factors – typically a value of 100. The EPA sets tolerance levels in parts per million (ppm; equivalent to mg/kg) and has defined the tolerance levels for glyphosate residue on numerous food commodities. Of course, sometimes trace amounts find their way into our food system – which is the crux of alarm spreading throughout the media. But let’s look at this rationally. Recently reports have been made of residues in the parts-per-billion on many of our favorite foods. 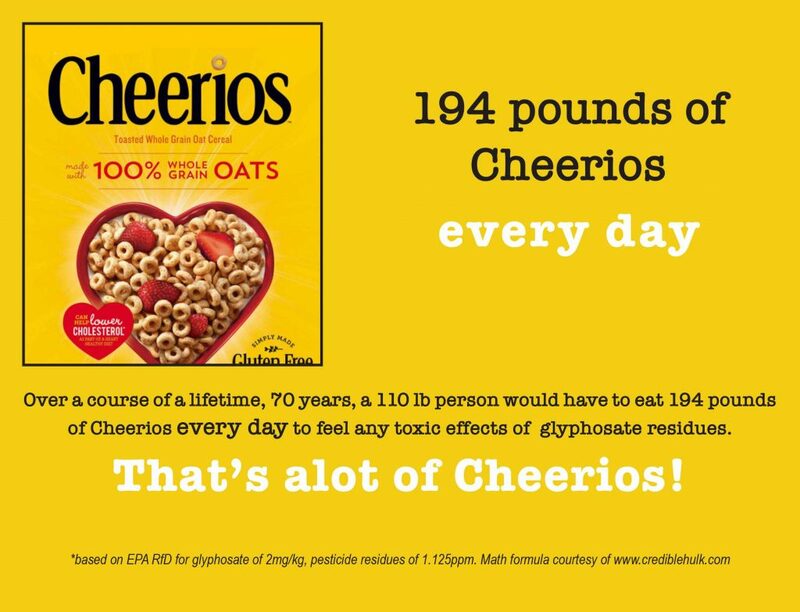 Cheerios, for example, was tested to have 1,125.3 parts per billion (translate to 1.1253 parts per million) residues of glyphosate. Parts per billion? As we have hopefully illustrated below, you would have to eat a lot of Cheerios to experience any adverse effects! What does one-part-per-million look like? What does one-part-per-billion look like? 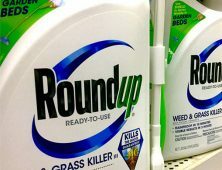 Unfortunately, companies are getting a bad reputation from anti-GMO groups that are spreading misinformation about the use of glyphosate. The US EPA, Health Canada, European Food Safety Authority, the German BfR, the World Health Organization all deem glyphosate to be safe for use. In another example, Media outlets have reported that glyphosate is now in one of our favorite sweeteners, honey! An FDA researcher tested 19 samples of honey, and in nine of those samples, found residue levels as low as 17ng/g in Brazilian honey and as high as 121 ng/g in honey from Louisiana. Now, translating that into actual consumption rates, a 125 lb person would have to consume 2,061 lbs of honey every day over the course of their lifetime to experience a poisonous reaction to glyphosate. REALLY? Is this actually cause for alarm? Or does it help sell a story when certain household staples are vilified for their “potentially dangerous herbicide content.” Unfortunately, in today’s media whoever yells the loudest often is the most trusted. You will not get sick by eating crops treated with glyphosate spray. Scientists replicate studies to see if they can get the same result. In the case of glyphosate, while there may be the rare outlier, there are hundreds of studies that have confirmed its overall safety profile when used as directed.